Indeed, even after a widely-publicized public relations debacle that we were the first to explore in our review of a University of Maryland news release claiming that their special chocolate milk helped football players with concussions, at least one media messenger was still unquestioningly parroting the unsubstantiated claims made in the news release. (The blog post in question was published the day after the university announced an institutional review of the whole matter.) Others, of course, failed to question the news release’s claims when it first came out, and published stories without demanding data, and therefore, without giving adequate explanations to readers. We often write that there can be harm from inaccurate, imbalanced, incomplete media messages about health care. But in this podcast, we profile a woman whose family was harmed – at least emotionally, while already facing a devastating cancer diagnosis. Here are before-and-after pictures of Vickie Smith’s brother-in-law, Richard Sarti. 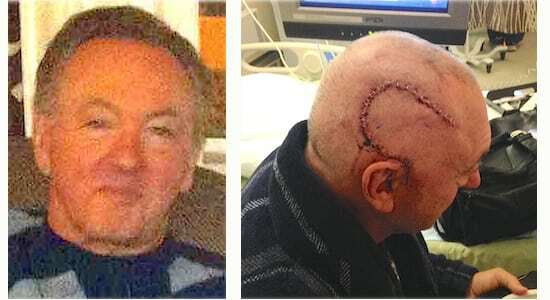 The second photo was taken after his glioblastoma cancer surgery. Here’s the news release from the Translational Genomics Research Institute, including the line, “And the FDA has already approved it” at the end of the 5th paragraph. Here was our review of that news release, which we headlined, “TGen uses slippery language to get around fact that “breakthrough” drug for brain tumors never tested in humans.” We gave it a low one-star score. You can imagine the impact of this kind of news on people with glioblastoma and their families. It makes me sick. “I deeply appreciate the efforts of those who invest themselves in shedding light on the truths left out of mainstream media and even official studies. It’s easy to think about how little difference it may make to a society that is largely conditioned to accept what they’re being told. People like you who continue to work against the odds are why there is hope in the world. The concept of evil prospering when good people do nothing is why what you and others do, to shine light on truth and expose lies, matters so much.